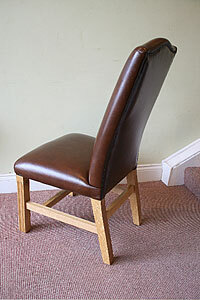 These are older Reproduction Leather Desk Chairs, that have been refurbished in our workshops. The wooden frames and leather upholstery are cleaned and polished. New Casters and tilt mechanisms fitted where needed. Also available. Another 1920's Original Tub Chair. Mahogany legs. Covered in the same Red Vinyl Leatherette material. 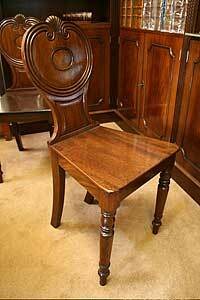 Solid Oak 1920's style Reproduction Swivel Desk Chair. 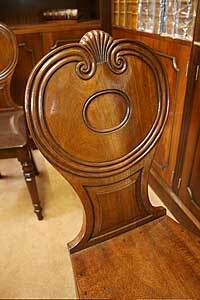 ( one of two available ) Wooden shaped seat. Rounded back support, four supporting legs. Price £ 395 each chair. A very collectable and interesting Mahogany Art Deco Glazed Bookcase ( circa 1920's ) Two outside locking cupboard doors are inlaid with wood and brass Marquetry, open compartments above. A central single drawer with original handles has a locking glass door below with two shelves inside edged with decorative leather frills. 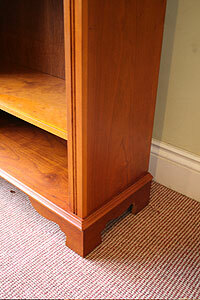 The back of the Bookcase has an up stand which is also inlaid. Lightly restored to revive the original colour. 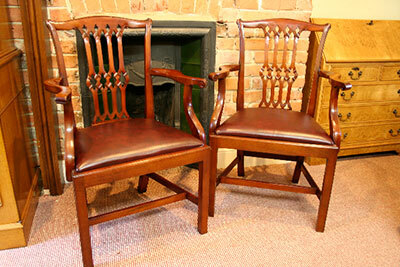 A pair of Solid mahogany victorian hall chairs, carved backs, lovely mellow mahogany shade. 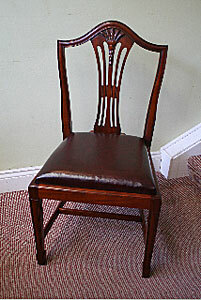 A high back single chair. Tan Leather upholstery. Solid oak legs. A Tall Open Bookcase. Five adjustable shelves. Shaped bracket feet. Yewood finish. 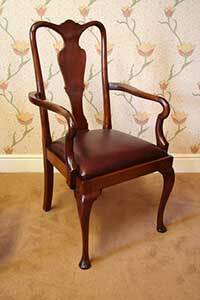 A Mahogany Regency Style Carver Chair. Scroll shaped arms. Brown leather buttoned upholstery. Individually nailed brass studs. A pair of one drawer Lamp Tables. Antique Mahogany finish with brass swan neck handles fitted. 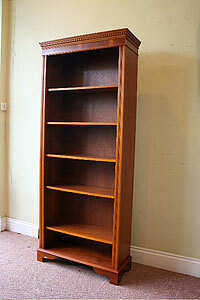 A Tall Mahogany Open Bookcase. Five adjustable shelves. Plinth Base. Polished to an antique mahogany shade. 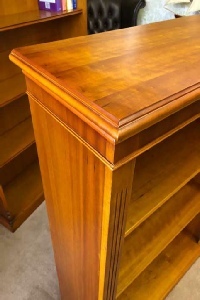 Small Burr walnut one drawer open bookcase on Queen anne legs with adjustable shelf. 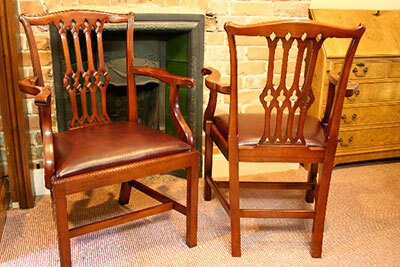 A Pair of Mahogany Chippendale style Carver chairs. Wine leather seats. Price £495 for the pair. 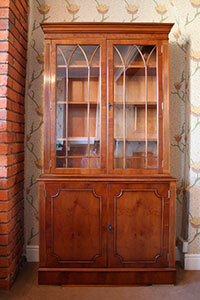 A Burr Elm Cupboard Bookcase. One single drawer and a cupboard with a loose adjustable shelf inside. Shaped plinth base. Attractive figured grain. A Yewood Coffee Table with a shaped base shelf. Round turned fluted legs. Re polished top. A fine quality Victorian Satin Wood and Ebony Occasional Side Table. A sturdy four spay legged base with a square central column. Four corner turnings, and a satinwood top with ebony inlaid. A Queen Ann Style Nest of Three Tables. Carver tops and legs. 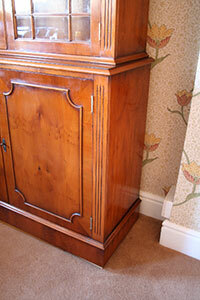 Polished to an antique mahogany shade and fitted with new Tan leather inserts under the protective glass tops. 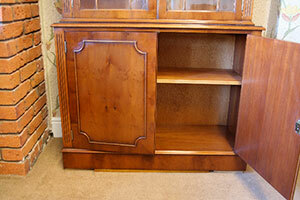 A Mahogany Corner Television Cabinet. Angle back corners allowing the cabinet to fit neatly into a corner. Split fold back doors giving space for a TV of up to 28" width x 22" height. There is also a fold away flap giving further storage for a DVD player and Sky box. Polished to a lighter antique mahogany shade with brass handles. 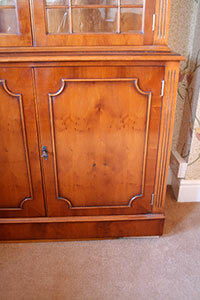 A Bow Fronted Corner Cabinet. 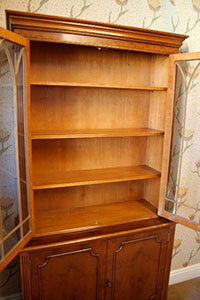 Yewood finish with two glass top shelves. 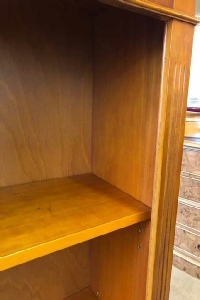 The base cupboard has a wooden shelf. 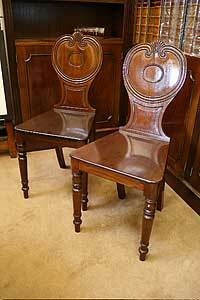 A set of eight Mahogany regency shield back style chairs. Carved wheatear design centre supports. H frame support between the legs giving extra support. Polished to a dark mahogany finish with newly upholstered seats in a neutral light gold fabric. Price £849 for the set of eight. A Larger open bookcase. Light Yewood finish. 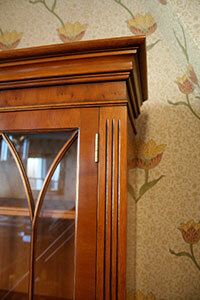 The vertical central dividing column separates the seven adjustable shelves that are in each side. Cut outs for skirting board allow the bookcase to sit flush against the wall. 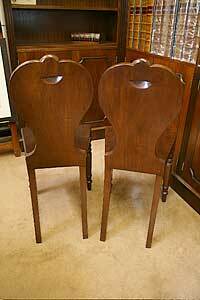 A pair of 1930’s Mahogany Queen Anne style carver chairs. 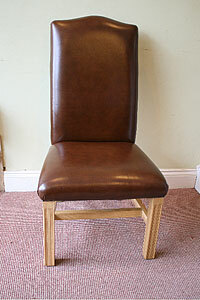 The seats have been re upholstered in Wine coloured hide leather. 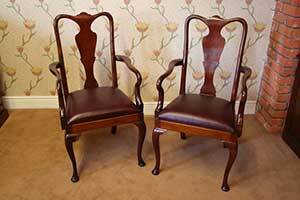 A Pair of Mahogany Reproduction single reception chairs. Brass inlaid back rails. Newly upholster green leather seats. Price for the pair. £445. 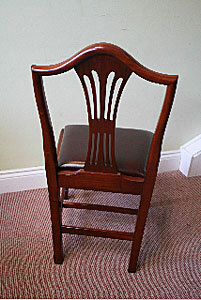 A Mahogany Carver Swivel Desk Chair. Fitted with a five leg base, gas tilt and lift action. 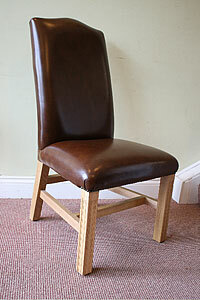 Wine leather buttoned seat. 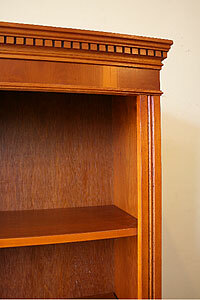 A Cherrywood Cupboard Bookcase. Two locking doors, adjustable shelf inside. Ideal for box files or larger books. Width 39” ( 100cm ). Depth 18’ ( 46 cm ). Height 32” ( 81 cm ). 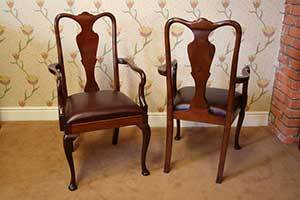 A Pair of Mahogany single reception chairs. A polished back rail support top and middle. New Green leather seats. Price for the pair £445. 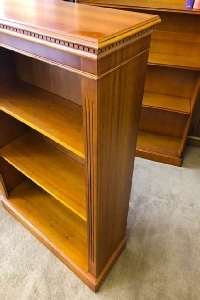 A Yewood Tall Open Bookcase. Four adjustable shelves. Reeded vertical columns. Plinth bases. 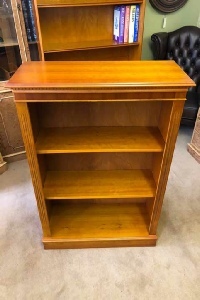 A Yewood Open Bookcase. Two adjustable shelves. Polished top surface. Plinth base.